Our evening came to a sweet end with Shrek and Strawberry Shortcake. 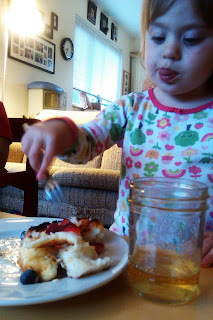 Bonnie had brought over some Angel Food cake and strawberries. She did something that I had never seen but will be sure to do again, she buttered then toasted the Angel Food cake before topping it with the berries. I added some blueberries to the mix, but I didn't have any whip cream, so I made a sauce of Sour Cream and Brown Sugar. (about 1 tbsp. to 1/4 cup of sour cream). It turned out really good! Tangy and sweet with the warm, crisped cake. Very tasty, and quite a hit! !